MANILA, Philippines – The May 2018 Chemical Engineering (ChemEng) board exam results including the full list of passers, top 10 examinees, top performing and overall performance summary of schools, among other related announcements are available at this website as PRC releases the full results online two (2) working days after the last day of board examination. As announced, 296 out of 636 passed the exams. The May 2018 Chemical Engineer licensure exams are administered by PRC Board of Chemical Engineering headed by its Chairman, Engr. Ofelia V. Bulaong and its members, Engr. Jeffrey G. Mijares and Engr. Cyd P. Aguilera on May 23-25, 2018 at PRC testing centers in Manila and Cebu. According to the Commission’s Resolution No. 2017-1068 entitled “Schedule of Licensure Examination for Year 2018”, the target release date of May 2018 Chemical Engineering board exam result will be in two (2) working days after the last day of board examinations or by May 29, 2018 (Tuesday). However, results may also be released earlier or later without prior notice. On the same exams conducted by PRC on November 2017, May 2017, November 2016 and May 2016, results were out after two (2) working days. The schedule of online appointment for issuance of Professional ID and Certificate of Registration will be from May 31 to June 1, 2018. Chemical Engineering is one of the programs with less number of examinees being administered by PRC. On the most recent Chemical Engineering board exams conducted November 2017, 627 out of 942 examinees passed. John Cyril Pastrana Claur from University of Saint La Salle and Jared Philip Marquez Condez from University of the Philippines - Visayas - Iloilo City topped the exams having 84.60% rating. UP Diliman ranked first in the exams having 80 out of 81 examinees passed or 98.77% rating. On May 2017, 310 out of 561 examinees passed. Wayne Lorenz Bagano Tandingan from University of San Carlos ranked first in the exams garnering 85.20% rating followed by Victor Juvida Lau Jr. from Mapua Institute of Technology - Manila having 85.00%. De La Salle University - Manila was the top performing school having 32 out of 34 examinees passed or 94.12% overall passing rate. During November 2016 of the same exams, 534 out of 918 examinees passed. University of the Philippines (UP) - Diliman ranked first in the top performing schools list having 67 out of 70 examinees passed or 95.71% overall passing rate. Clarence Joseph Uy Co from De La Salle University (DLSU) - Manila ranked first in the exams having 85.50% rating followed by Ariel Raye Vivas Rica from UP Diliman having 84.20%. Meanwhile below is the statistics of Chemical Engineering board exam results in the last four (4) exams. 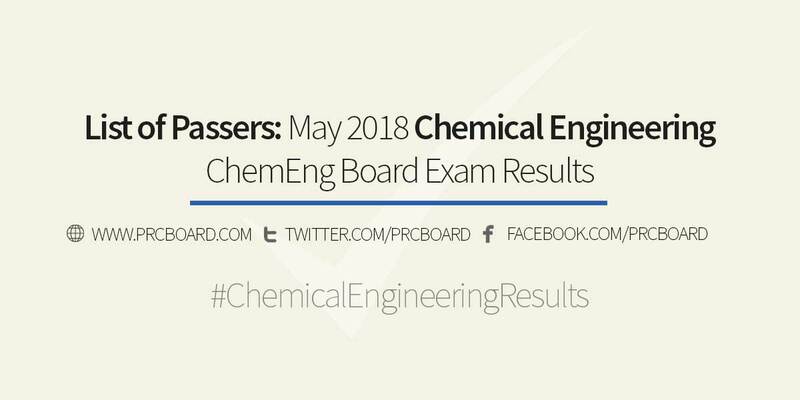 To receive up-to-date news on full results of May 2018 ChemEng board exams, we advise our visitors to bookmark and keep locked on this page, refer to PRC official website or follow us at our social media pages via Facebook and Twitter. What time will it be posted?